Elizabeth Taylor was the owner of the most expensive engagement ring. It was given to her by Richard Burton. The ring is a 33.19-caret type IIa certified diamond, which means this diamond is exceptional. It is chemically pure and has a high clarity. The diamond is an Asscher-cut and has a large cutlet facet. This ring tops the chart of the top 10 world's most expensive engagement rings with a value of $8.8 million. All of these engagement rings are exquisite and show great taste by the men who picked them. These rings are works of art and will be appreciated for a long time. 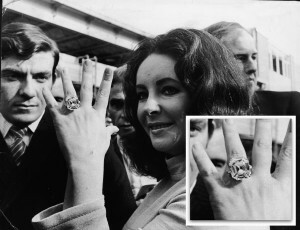 Elizabeth Taylor's ring was auctioned off after her death and was purchased by an Asian collector. I'm sure other collectors will love the chance to own any of the top 10 word's most expensive engage rings. Of course these rings are to die for, but we can only dream of owing a piece like those. With a more down to earth price, we found a beautiful piece from ICE, what do you think?